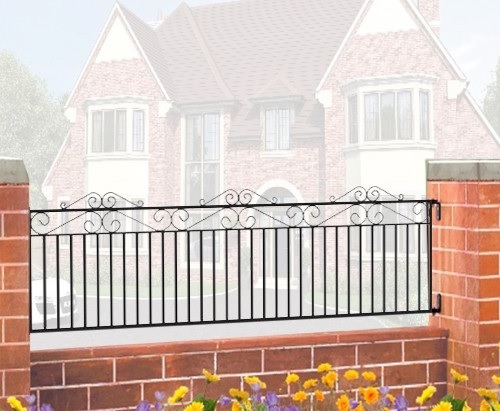 Marlborough garden railings are available to order online in a choice of sizes and feature a solid steel framework, metal infill bars and decorative wrought iron style scroll work to achieve a timeless design that will appeal to the tastes of many property owners looking to add height to existing boundary walls. The Marlborough Metal Railings have been designed to complement the range of matching gates and fence panels and as such will allow you to create a harmonious look to your home and garden whilst remaining very competitively priced. Featuring traditional decorative elements for timeless appeal each railing is carefully hand crafted in the UK to ensure strength and durability is inherent as standard and as such will provide years of security and aesthetic benefits. Perfect for a variety of locations such as boundary walls or between pillars the railings can be specified in a choice of standard sizes or where required may also be purchased in a made to measure size. Suitable for many residential applications where a traditional style is the design of choice. Decorative wrought iron style scrollwork improves visual appeal. Handmade in the UK using high quality solid steel components. 20mm x 8mm metal frames, 10mm vertical infill bars and 10mm x 3mm scrolls. Black primer/undercoat (railings must be painted prior to installation – (contact us for pre finished options). Available to order in 3 standard size options (please be aware the railing design may vary from the image shown depending on the width option you select). Need Help Ordering Marlborough 18” High Garden Railings? Call now on 0844 804 5577, email sales@gardengatesdirect.co.uk or fill in our online form. You can also find lots of information online to help you through the order process. For example if you need help with sizes we recommend you read the measuring guide or if you have a general query go to our FAQ`s page. Furthermore if you can`t find the size you need to order why not learn about our made to measure service. Alternatively we also recommend the following pages. Do you need additional items to complete your railing installation? Where a number of panels need to be joined together or where no existing support is present we recommend you choose from the following items. Looking for a low maintenance rust resistant finish? To find out more information on the factory painted options available please contact us to get a price or to discuss you options.